Dessert cutlery had always been more highly decorated than that for the earlier courses, to reflect the status and expense of the dessert. Handles, in particular, were often more ornate. 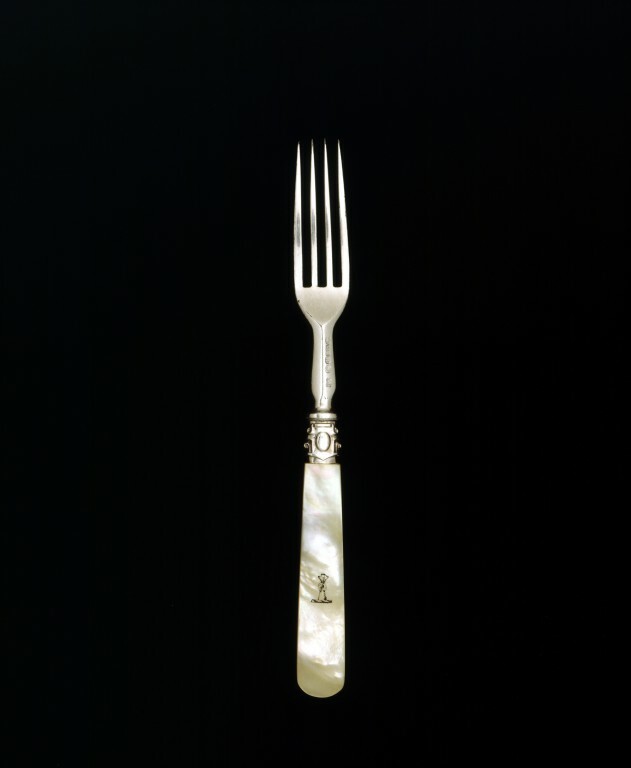 This fork has a handle made of mother-of-pearl (the most expensive material used for such purposes), which adds to the effect of luxury. In the Victorian period fruit forks were commonly sold with fruit knives in boxed sets of a dozen. The manufacturer Elkington & Co. could charge up to œ22 a set in 1885 for richly engraved blades with carved handles and accompanying matching knives. A.B. Savory was largely a retailing business, selling the usual stock of silver and electroplated tableware and cutlery, clocks, watches and jewellery. Marked on the handle PS, G, a symbol of a downpointing triangle with a cross above ( twice ) and ABS all in individual shaped lozanges. From a set of 6. Cutlery for dessert was sold as a separate service. It was often more decorative, costly and of a different pattern to the cutlery of the earlier courses. The principal table service might be in silver but the dessert cutlery was mostly gilt. This differentiation began in the eighteenth century and continued through until the early twentieth century. Elkington and Co sold dessert cutlery in pairs per dozen for up to £20 with pearl handles and engraved blades." Dessert cutlery had always been more highly decorated than that for the earlier courses, to reflect the status and expense of the dessert. Handles, in particular, were often more ornate. 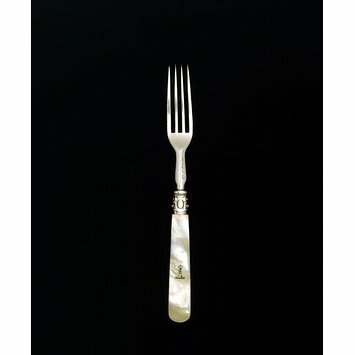 This fork has a handle made of mother-of-pearl (the most expensive material used for such purposes), which adds to the effect of luxury. In the Victorian period fruit forks were commonly sold with fruit knives in boxed sets of a dozen. The manufacturer Elkington & Co. could charge up to £22 a set in 1885 for richly engraved blades with carved handles and accompanying matching knives. Cutlery for dessert was sold separately from the main set of cutlery. It was often more decorative, costly and of a different pattern. All sorts of cheaper versions were produced but for the grandest tables, the principal table service might be in silver and the dessert cutlery was often gilt. This differentiation began in the 18th century and continued until the early 20th century.